Thoughts on the creation of my new eBook series, launched this month. As a writer of concert programme and CD booklet notes of many years’ standing, I’ve often felt hampered by the limitations of the written word when trying to describe music’s inner workings. It can be a challenge conveying how one chord sounds different from its neighbour, how one motif is condensed or stretched into another, or how a composer structures an entire movement. A certain language has built up to attempt to express these often inexpressible things, but what has been needed is a way to make it work for people of differing musical knowledge. Now the answer has arrived with modern technology and its ability to bring together several means of communication – the word, the visual image and sound – in the concept of the eBook. There’s no longer any need to be restricted to just words and pictures, or even to a linear approach to covering a subject. And with ‘bits’ rather than pages to play with, there’s the luxury of having the space to explore a subject in far more detail than offered by traditional media – in other words, it is easy to take the ‘everything-you-wanted-to-know’ approach and tackle the piece from a number of different angles. A further advantage of the medium is that in its inherent modular make-up it never gives the impression to the reader of being a weighty tome – an eBook can either be read through from ‘cover to cover’ or dipped into with ease, using internal links to take a more serendipitous approach. It has therefore been a liberating experience working on my new eBook series, Masterpieces of Music. Pop-up side features mean I can legitimately go off on tangents – to explore side issues relating to the work, or expanding on areas in a detail that would otherwise slow down the main argument of the text. 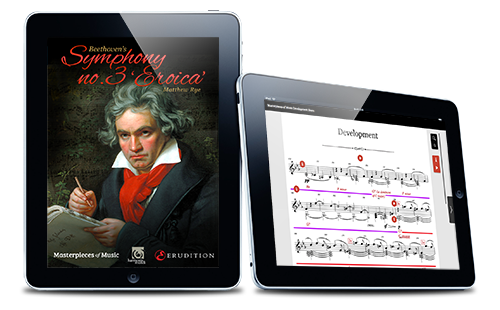 For instance, in the launch title on Beethoven’s ‘Eroica’ Symphony, I have been able to dwell on the composer’s love-hate relationship with the figure of Napoleon, or the links between the symphony’s heroism and the character of Prometheus, while not distracting the reader who simply wants to read the chronology of the work’s creation. But more than just telling the story behind the writing of the work, I have been able to explore the music’s very essence in a descriptive analysis in terms – I hope – that will be appreciated as much by the inveterate concert-goer or music student as by those just starting out in their appreciation of great music from a non-musical background. There’s always a danger that the beginner might be discouraged from reading further if the text is peppered with copious music examples, but in these digital books, as well as the examples using a simplified notation where possible, each is paired with an audio file that plays the notes with the sound of a keyboard. 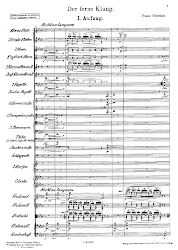 So individual motifs are picked out, harmonic progressions displayed and whole sections of a movement – in the case of the Beethoven, the Allegro con brio’s miraculous development section – cut into pieces and put back together again in both visual and aural ways. Similarly, all musical terms in the text are linked to their definitions via pop-ups, with layman’s language used to enable greater appreciation of music’s many, and often convoluted, concepts. With such a wealth of great music available, it hasn’t been easy choosing the pieces to focus on for this series, at least for the first few. But the ‘Eroica’ was an obvious starting point, given its epoch-making status and general familiarity. Then it was a case of taking key works to represent different musical periods and genres, with the result being an initial group of five works: the ‘Eroica’, Bach’s Mass in B minor, Brahms’s First Piano Concerto, Schumann’s Dichterliebe and Debussy’s La mer. My role as a music-writer and critic has always been to enthuse about great art and performance. I hope some of that advocacy comes across in the texts of these short books. And the writing has been a rewarding task in itself, delving deeply into the history of the period of the work to set the broad background and creating timelines that reveal what else was going on in the cultural world at the same time, as well as making a detailed study of how the composer put the given piece together as music. Being able to work on the text concurrently with creating music examples and audio clips has also made the process of putting together the ‘walk-through’ (a less forbidding term than ‘analysis’) more seamless than I might have expected. The icing on the cake has been an arrangement with Harmonia Mundi, one of the world’s leading independent record labels, to take excerpts from its acclaimed recordings as a supplement to the keyboard-only clips in the walk-throughs.